Does your dog have a dull and lifeless coat? Do you wish your dog had a healthy looking, shiny, silky, soft to the touch coat? If so then this article is for you. Our dog’s coat is one of their most prominent features and we should all want our dog’s coat to look and feel great. As well as being aesthetically pleasing for us, it’s also very important for your dog’s health and wellbeing to have a well looked after coat. Fortunately, there are many remedies to improve the health and condition of your dog’s coat. In this article, I’ll talk about why your dog might have a dull or unhealthy coat in the first place, what you can do to treat and improve this and recommend some supplements and products that might be of interest to you. Why Your Dog Might Have A Dull Coat & What To Do About It? Lack of vitamins & supplements. If your dog suffering from an illness the skin and hair can be the first to suffer. The skin is a large organ and therefore needs large amounts of vitamins and nutrients to maintain its normal health. Also, when your dog is ill, its body will try to protect it’s vital organs first such as the brain and heart and will divert nutrients from less vital organs such as the skin. So when your dog is suffering from an illness or not receiving the correct vitamins and nutrients in their food it can sometimes be seen in the health or their coat. 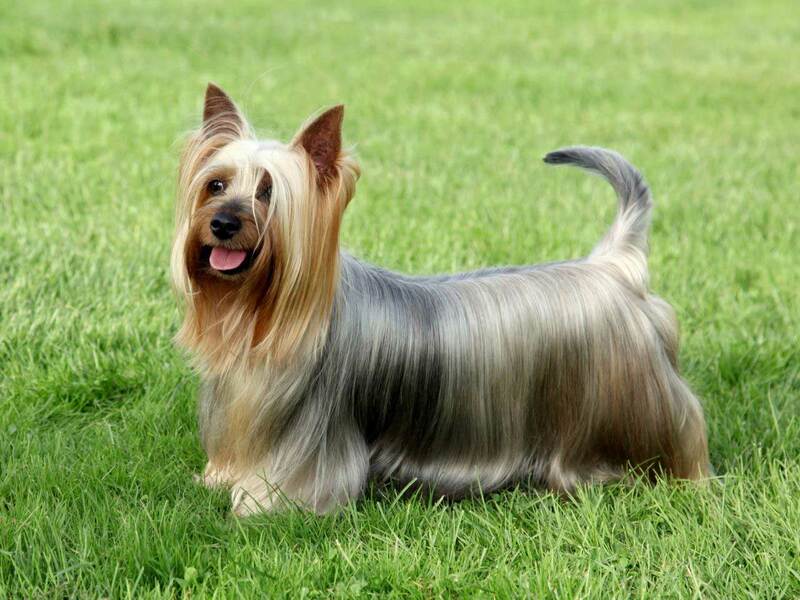 Their coat may become extremely dry or dull instead of feeling soft and looking shiny. 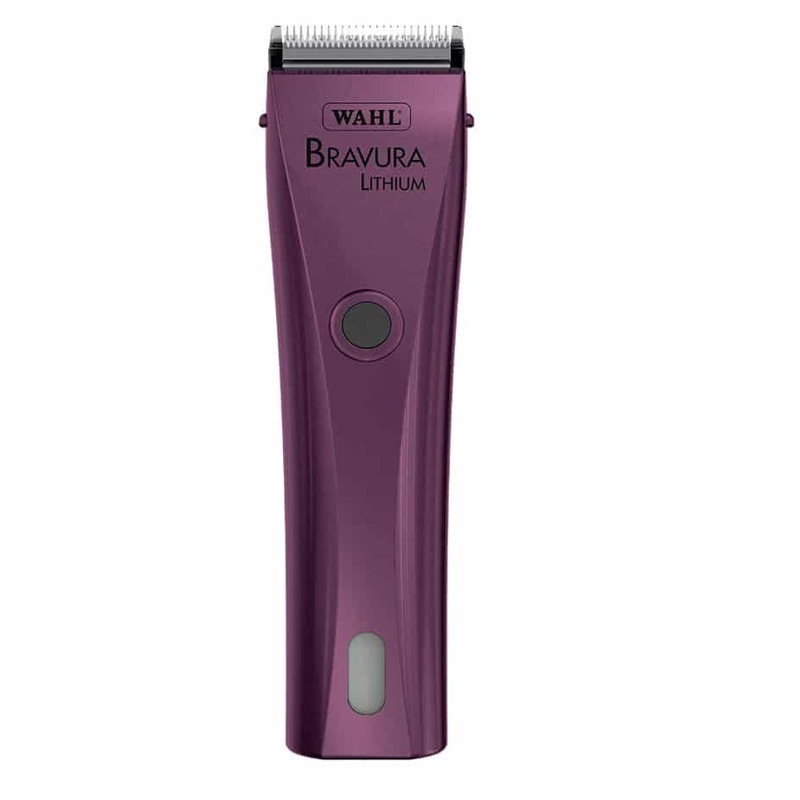 The hair may feel more brittle and have an unusual rough texture. Also, for dogs that have a darker coat, you could possibly notice a change in colour to a dull grey. If your dog is showing any of these symptoms then you should take them to the vet immediately for a professional examination and possible diagnosis. The wrong kind of shampoo and conditioner. Poor quality shampoo of conditioner. One of the causes of a dull coat or even loss of hair could be caused by a parasite infection. Parasites will live on or in your dog’s coat or skin to nourish themselves and reproduce. 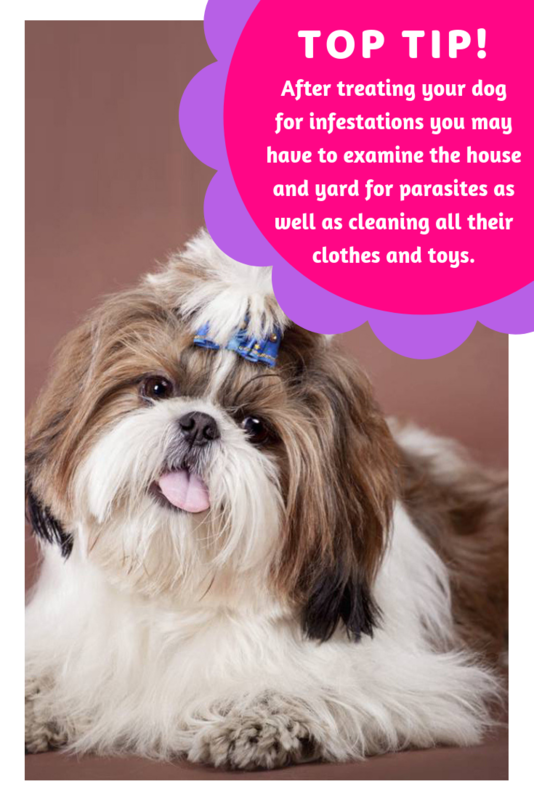 A parasite could be transmitted to your dog in many places including a grooming salon, a kennel, shelters or even over the park. There are two types of parasitic infestation – internal and external. If your dog has an external infestation in the coat or skin it can cause them to have inflamed or irritated areas of skin, leading to scratching or biting making the situation even worse. In the more serious cases of internal infestations, the parasites can cause malnutrition that can then cause hair loss. The most common types of external parasites are fleas, ticks and mites. Fleas survive on the skin by ingesting the dog’s blood and the saliva they produce can cause the skin to become irritated and itchy. Ticks are tiny arachnids that also ingest blood and as well as causing hair loss can lead to more severe medical conditions. Mites are microscopic creatures and are the cause of mange and scabies in dogs. Hair loss in dogs is referred to as alopecia and below are some of the symptoms of this condition. An obvious dullness in the coat. If your dog is showing any of the symptoms above or you suspect they have been infested by a parasite then you should take them to the vet as soon as possible. Your vet will first give your dog a physical exam to look for the obvious signs and may do other tests including a blood count, chemistry panel, skin scrape, blood smear, urinalysis and a faecal exam. The treatment for a parasitic infestation will depend on the type of parasite. External parasites such as fleas, ticks and mites will be treated with specially formulated shampoo and maybe medication. Internal parasites may be treated with deworming medication. If your vet recommends using an anti-parasitic shampoo then there are a variety of good quality products available and below I will review some of the shampoos I think are worthy of a mention. 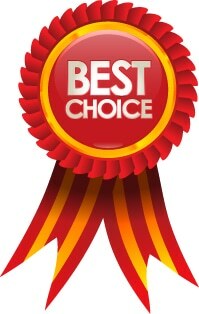 I only recommend good quality products made with natural ingredients and have good ratings and customers reviews. This way you can always be sure that you are buying a decent product from a reputable seller. 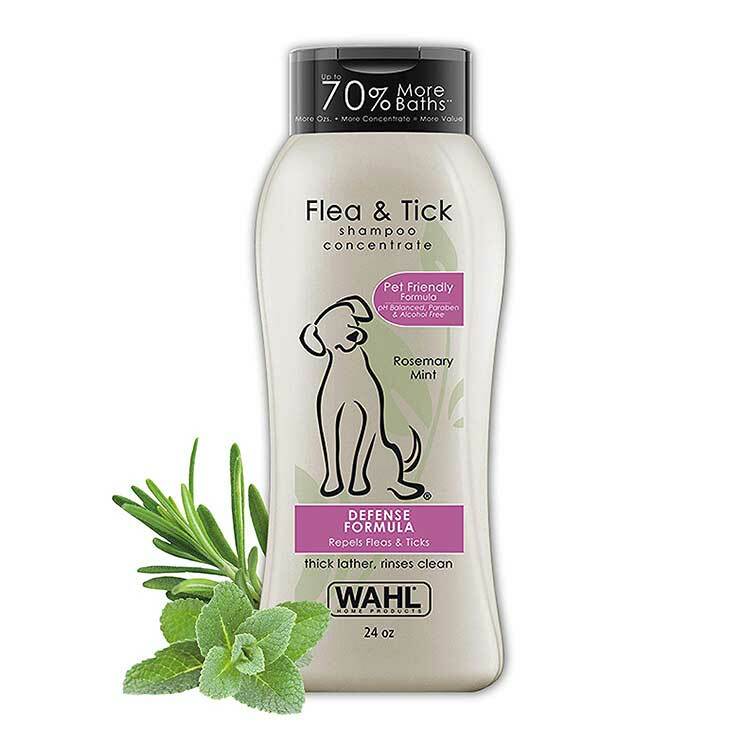 My first choice would be the Wahl Flea & Tick Shampoo. This product is formulated with rosemary, mint and cedar oil and contains no toxic chemicals making it suitable for dogs of all ages. It has a gentle formula using no harsh ingredients or strong detergents making it an excellent choice to help with your dog’s skin and coat. This shampoo has a 4.5 out of 5 star rating on Amazon with over 850 reviews on that you can read for yourself here. Repels fleas & ticks for up to one week. More concentrated than other leading brands. More ounces per bottle than other leading brands. Another good choice of shampoo if your dog is suffering from parasites is the Avara Flea & Tick Shampoo. 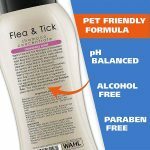 This a specially formulated antiparasitic shampoo that uses only natural ingredients and is suitable for dogs of all breeds and ages including puppies. It has a purely botanical formula including lemongrass, peppermint, cinnamon, thyme, clove, red cedar and rosemary giving it a subtle and pleasant smell. It doesn’t include any harsh detergents or toxic chemicals making it perfect if your dog has any allergies or sensitive skin. And they also make a small donation to animal rights charities from each purchase. This shampoo has a 4.3 out of 5 star rating on Amazon and you can read the reviews for yourself here. Specially formulated to repel fleas and ticks. No harsh detergents or toxic chemicals. Botanical ingredients for a subtle and pleasant smell. Cleanses, strengthen and moisturize your dog’s skin. Nourishes and strengthens your dog’s coat. A small donation to animal rights charities from each purchase. There are a variety of allergies that can have an effect on your dog’s coat including dust, pollen, smoke, perfumes, food, shampoo and even mould. Allergies can cause many different symptoms but for the purpose of this article, we are only concerned about the ones that might affect your dog’s skin or coat. If your dog has an allergic reaction to something that affects its skin it may lead to areas of irritation and soreness, causing your dog to scratch or chew at the affected area. This, in turn, can lead to loss of fur and a damaged coat. The treatment for a skin or hair condition caused by an allergic reaction will depend on the specific allergy your dog is suffering from. 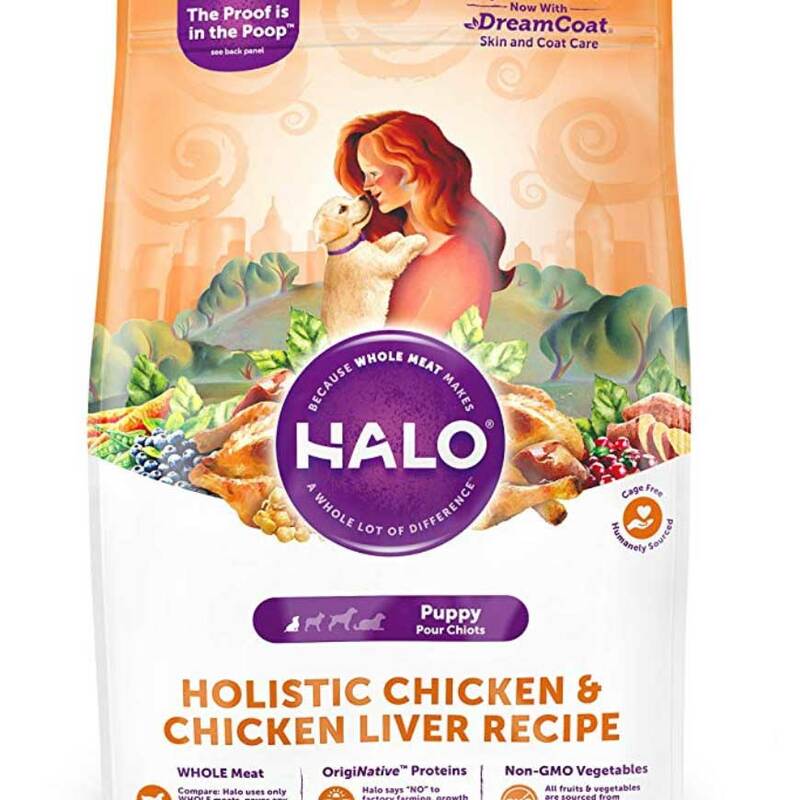 If it is due to something in their food they will need to be given a specially formulated hypoallergenic dog food and possibly vitamin and nutrient supplements. In other cases, they may need medication and even injections. It’s important to note here that if you think your dog is suffering from an allergic reaction then you should take them to your vet as soon as possible to receive a professional diagnosis and course of treatment. The most common cause of a skin allergy will be a reaction to something in your dog’s food. 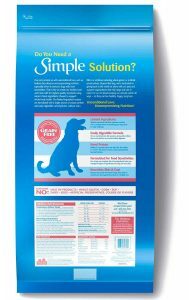 One of the ways to discover what food your dog is allergic to is to use a home allergy test kit and your vet may recommend this to be the first course of action. Affordable allergy testing kits are available to purchase. 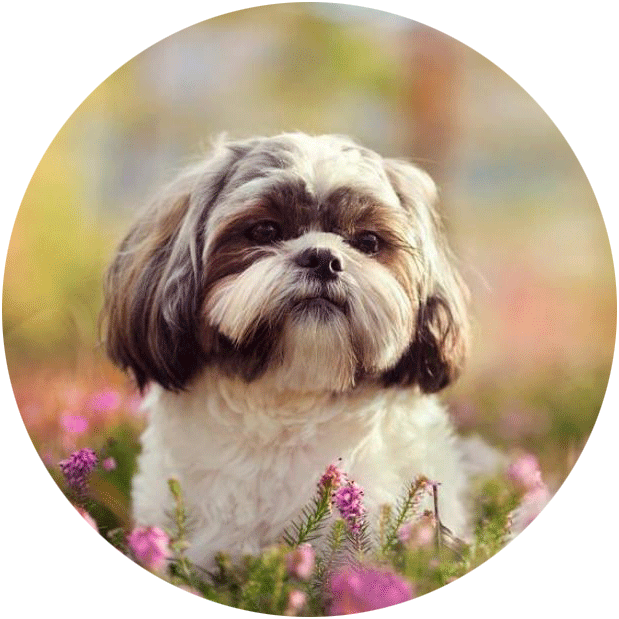 They are easy to use and they test an extensive array of food that your dog might be allergic to as well as environmental allergens and nutritional deficiencies. 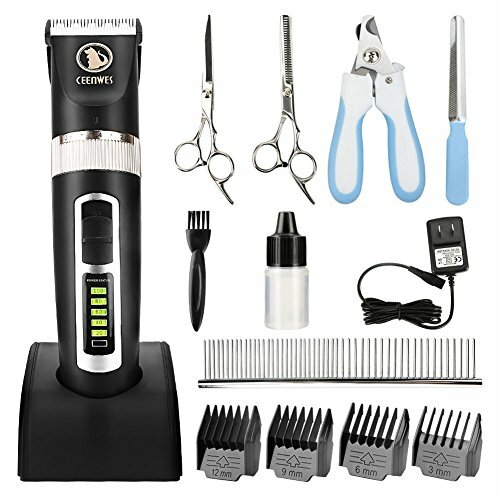 These kits only require you to cut off a small amount of your dog’s hair and then send it back to be tested in the lab and then wait for the results. A good home allergy testing kit is the 5Strands Allergy Sensitivity & Intolerance Test Kit. It tests for over 300 of the most common food types, environmental allergens and nutritional deficiencies. Another good feature of this product is that you receive the results within 7-10 working days. If you would like to read more about home allergy testing kits and reviews of the best ones available then please read my article Allergy Test Kits For Dogs. If your vet suggests that you change your dog’s food to a hypoallergenic dog food then there are a variety of choices available. Below I will give some information and links to a few produced by reputable brands that I would recommend. 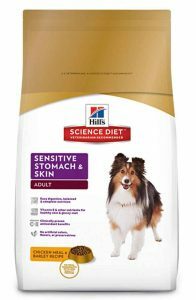 The first one I would recommend is Hill’s Science Diet Dog Food for sensitive skin and stomach. This is a natural dog food made with no artificial colouring, preservatives or flavouring. It has been scientifically formulated to be gentle on your dog’s stomach containing a balanced nutrition and easy to digest ingredients. It also contains vitamin E and omega-3 fatty acids that are essential for a healthy and shiny coat. 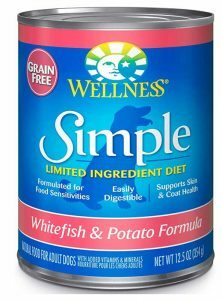 It’s listed as Amazon’s choice for a hypoallergenic dog food and has a 4.2 out of 5 star rating from over 1,200 customers. You can read the reviews for yourself here. Specially formulated for sensitive skin and stomach. 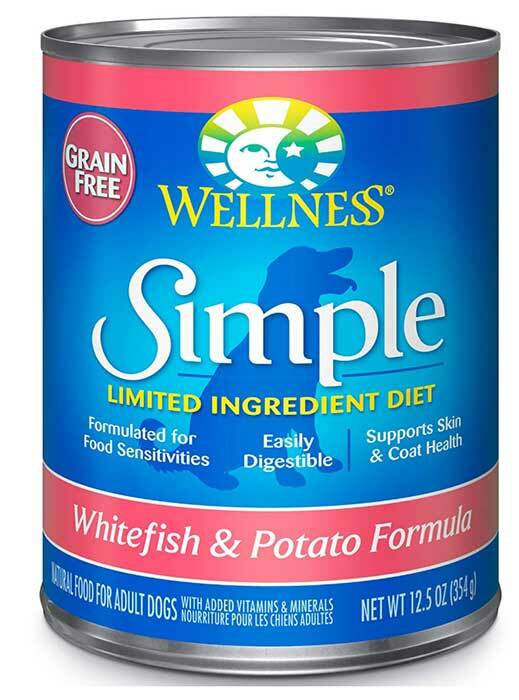 Contains omega-3 and other vitamins for a healthy coat. Contains antioxidants, vitamin C & E to help immune support. Available for both large and small breeds. 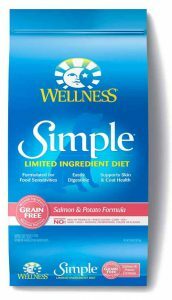 Another excellent dog food is the Wellness Limited Ingredient Dog Food. This product is produced by a reputable brand and uses only natural ingredients. 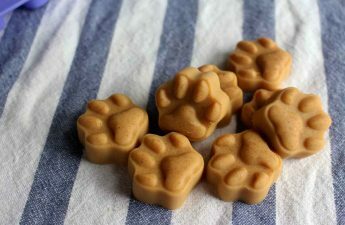 The food contains only limited ingredients making it a good choice for dogs with food allergies. It contains a single source a good quality protein, easily digestible carbohydrates and contains no gluten, wheat, fillers or artificial additives. It comes in 4 different flavours, has a dry or wet option and is also available for small breeds. This food has a 4.3 out of 5 star rating on Amazon and you can read the reviews for yourself here. Formulated to be easily digestible. Short but complete list of ingredients for a balanced diet. Single source of high-quality protein. Nourishes healthy skin with flaxseed. No gluten, wheat, corn, dairy, or eggs. No fillers, artificial additives, preservatives or flavours. Comes in 4 different flavours. Available in a small breed variety. Another reason why your dog’s coat might look dull or unhealthy could be the result of using a poor quality shampoo and conditioner or the wrong kind. First off it’s important to mention that you should never use human shampoo or conditioner on your dog. Shampoo designed for humans has a more acidic pH balance and can cause severe irritation and scratching for your dog. This is because humans have more layers of outer skin and can handle the more acidic formula. Therefore using human shampoo and conditioner on your dog could have an effect on how shiny and healthy your dog’s coat is. If you want your dog’s coat to be as healthy, shiny and as soft as possible then you need to use a good quality shampoo and conditioner. When purchasing these products you want to look out for 3 things – the type of cleaning agent, the correct pH balance for dogs, and if they contain harsh chemicals and other bad ingredients. Using a shampoo and conditioner with a good quality cleaning agent is very important for the health of your dog’s coat. To keep their skin moisturised a dog will secret oils from their skin and as time passes these will build up and make their coat oily and greasy. The cleaning agent in the shampoo will remove these oils and how well it works will depend on its quality and concentration. Inferior shampoos will use a poor quality cleaning agent in a lower concentration that can leave your dog’s fur still feeling greasy and looking dull even after you have bathed them. On the other hand, quality products will do a good job at removing these oils and leave your dog’s coat looking fresh and shiny. Using a shampoo and conditioner that has the correct pH balance is very important. The pH scale is used to measure how acidic or alkaline a substance is and should be suitable for your dog’s skin. Whereas humans can use shampoo with a more acidic pH level around 4.5 to 5.5, a dog will need a more alkaline shampoo with a pH balance or between 6 and 7. Using inferior products that are not specially formulated for dogs can lead to problems such as dry eye, skin irritation and yeast infections. Some inferior dog shampoos will contain poor cleaning agents and other harsh chemicals that can ‘over-wash’ your dog’s skin and coat removing too many of the natural oils your dog needs to moisturise their skin. These harsh detergents can damage your dog’s skin and coat leaving their coat looking worse than it did before. If you would like to read a more thorough explanation of what shampoo and conditioner to use on your dog then please read my article – What Is The Best Shampoo & Conditioner For Your Dog. 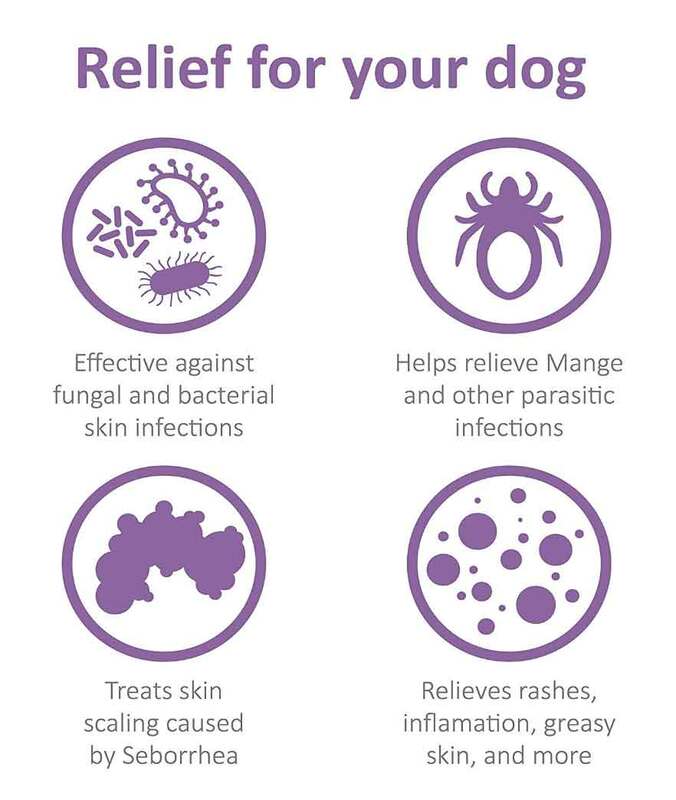 To avoid the issues listed above I always choose to use a product that has the correct pH balance for my dog’s skin and has only 100% natural ingredients. Below I’ll list a few that I think tick all the boxes to avoid the problems above and will leave your dog’s coat looking healthy. They all have excellent ingredients and are free of any harsh chemical or other bad ingredients that could cause any damage to your dog’s skin and coat. Earthbath shampoo and Earthbath conditioner are produced from 100% all natural ingredients. It has no synthetic perfumes, dyes or harsh chemicals that could damage your dog’s coat. This is an excellent product for fur that is particularly oily and will help to promote healthy skin. This shampoo and conditioner will also moisturise your dog’s skin and will help to produce a nice shiny and soft coat. This brand also provides the shampoo in different scents, including vanilla, rosemary and mango. All natural and biodegradable ingredients. Suitable for sensitive skin and allergies. Helps to heal areas or dry or damaged skin. This Earthbath Shampoo has an excellent 4.4 out of 5 rating from over 2,500 reviews on Amazon. You can check out the reviews for yourself here. Sofee & Co products and made using organic ingredients and are free of any chemicals and unnatural colouring. These products have a gentle formula and are ok for weekly use. All their products are cruelty-free and produced with 100% natural ingredients making them both safe for your dog and the environment. The shampoo has a PH balance of between 5 and 7 that is perfect to promote a healthy coat. Does not strip your dog’s fur. No parabens, sulfates, mineral oils, phthalates or artificial dyes. Excellent Amazon rating and reviews. Sofee & Co dog shampoo also has a 4.4 out of 5 star rating from over 2.500 reviews on Amazon. You can check out the reviews for yourself here. Grooming your dog is important for maintaining your dog’s health as well as their appearance. Grooming is important for all dogs but more so for dog’s that have a longer coat. Obviously, if your dog has a long coat, you will need to spend more time grooming them and more frequently than those with shorter haired dogs. Brushing your dog’s coat is important no matter what breed you have. Regular brushing will help to remove dirt, dandruff, dead hair and other unwanted debris. Brushing will also encourage your dog’s skin to produce natural oils in their fur that are vital for healthy skin and a good looking coat. As you continue to brush these oils will be spread over your dog’s coat giving it a shiny appearance. Another reason to groom your dog is that it will give you a chance to look for any abnormalities on the skin or in the coat. For example, while grooming you should look for any skin problems such as dry patches or sore areas, fleas and ticks and also check for any issues with their teeth, ears, eyes and nails. By spotting problems early they can be more effectively treated and may save your dog some future discomfort and pain and halt any symptoms developing into something more serious. To groom your dog properly you will need the appropriate brushes and comb and may also like to use a detangling or dematting spray. For my dog, I use a slicker brush, a matt splitter and a comb. 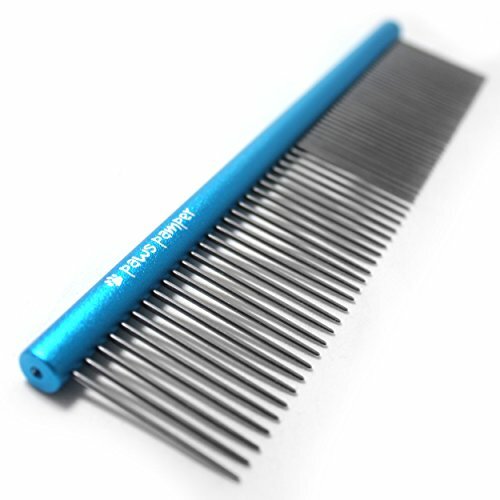 They each have a specific purpose and you can read more about these brushes and why they are important in my article – The Best Brush For A Shih Tzu. This article should also be useful even if you own a different breed of dog. If you are feeding your dog a quality dog food, there are no other underlying health issues and you are regularly grooming your dog then their coat should be already looking healthy and shiny. In this section, I’ll discuss the vitamins and micronutrients that are important for a healthy coat and recommend some quality dog foods that will fulfil this part of your dog’s diet. 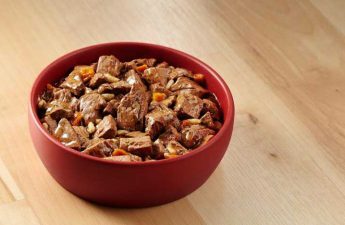 A lot of poor quality dog food can be missing the important nutrients your dog needs to maintain a healthy coat and this can lead to your dog’s hair being dry and dull. The most important nutrient for the health of your dog’s skin and coat is the omega-3 fatty acid. This supplement will help improve the way skin cells are produced and organised in the body. Scientific studies have shown that if a dog’s diet is low in omega-3 the skin will appear disorganised and can lead to irritants and infections damaging the skin and coat. On the other hand, dog’s that have a diet rich in omega-3 show much better organisation of their skin cells leading to more protection. Other vitamins and nutrients that are important for your dog’s skin and coat are vitamin E, C, B and zinc. Vitamin E and zinc are important as they help to improve the bioavailability of omega-3. Vitamins C and B (B12, riboflavin, thiamine, biotin, pyridoxine, d-pantothenic acid) are antioxidants and fight against damaging free radicals as well as improving collagen (skin protein) and skin immune function. After researching different brands of dog food and the ingredients they use, I have selected 2 that I think tick all the boxes for a well balanced healthy diet and contain all the necessary vitamins and nutrients for healthy skin and a soft, shiny coat. 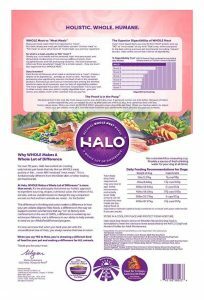 My first choice is Halo Holistic Natural Dog Food. 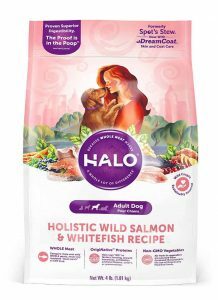 This dog food is made with whole meat rather than a meat meal, contains no growth hormones, antibiotics, artificial flavours, artificial colours and artificial preservatives. It contains omega-3 and omega-6 as well as the other vitamins nutrients listed above to help nourish the skin and coat. This dog food comes in a variety of flavours and is available for puppies, small breeds, adult dogs and senior dogs. It has a 4 out of 5 star rating on Amazon and you can read the reviews here. Omega-3 & 6 fatty acids for healthy skin & coat. Helps to maintain muscles and energy levels in older dogs. No growth hormones or antibiotics. 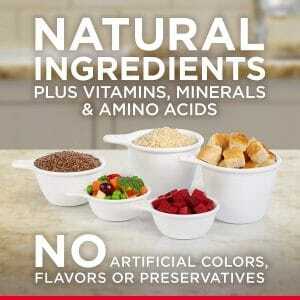 No artificial flavours, colours, or preservatives. 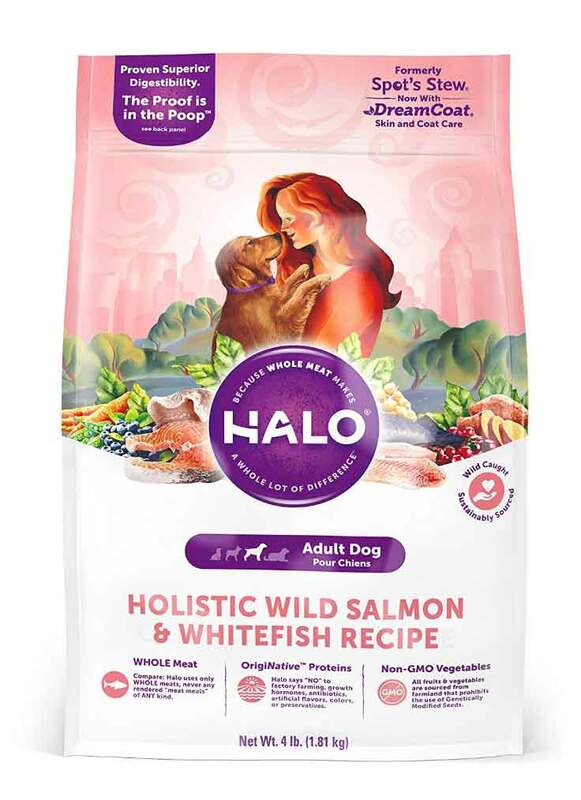 Check the price of Halo Holistic Natural Dog Food on Amazon using the links below. 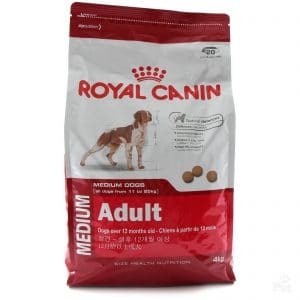 One of the most reputable dog food brands is Royal Canin. They have an extensive range of products catering to different breeds, ages and sizes. 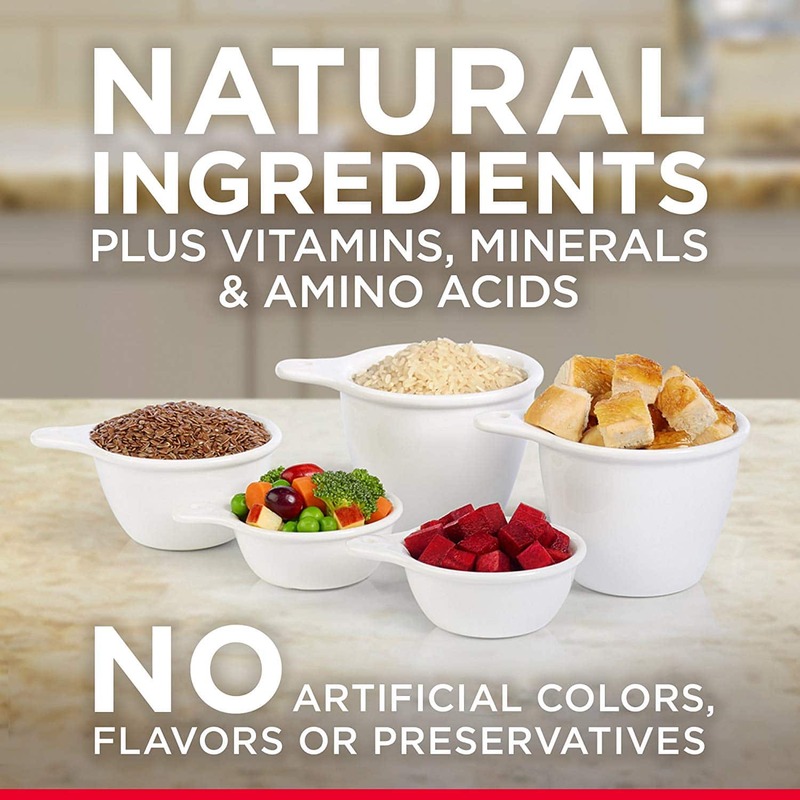 They have researched breed-specific traits and use the latest scientific and nutritional research, gathered from veterinarians and nutritionists, to create the precise nutrition your dog needs. 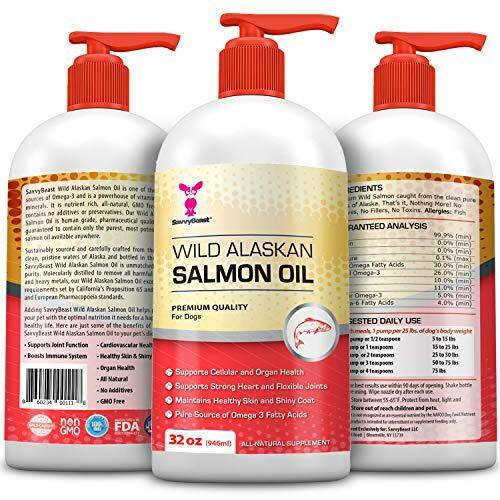 They use high-quality protein sources with specific nutrients and vitamins including the omega-3 fatty acid and other vitamins for a healthy, shiny coat. They even design the shape, size and texture of the kibble to compliment the jaw structure and biting pattern of your dog. If you prefer to buy food specifically tailored for your breed then please view our chart of Royal Canin dog food for links and reviews. Your dog is diagnosed with a vitamin or mineral deficiency. Your dog has a very low metabolism and is required to lose weight. Your dog is diagnosed with a disease that can be treated with a supplement. You cook your dog’s meals yourself. Your dog has joint discomfort. It’s important to mention here that if for any reason you think your dog is not getting the correct vitamins and minerals in their diet and are they are showing any signs of being unhealthy, you should take them to see a vet as soon as possible for a professional examination and diagnosis. 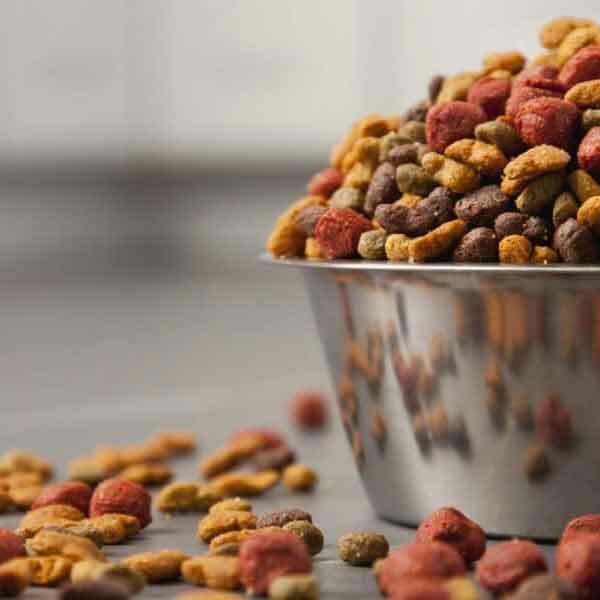 As you may have read above, if you are feeding your dog a good quality food then they should already be getting all the vitamins and nutrients they need to stay healthy and this will include them having a healthy coat. However, if there are reasons why this is not possible you may want to supplement their diet with certain vitamins that have a direct effect on the quality of their skin and coat. The most important supplement for your dog’s skin and coat are the omega 3 & 6 fatty acids and this is what your vet will usually recommend for your dog. They are known as essential fatty acids as they are not naturally produced in the body and therefore need to be part of your dog’s diet. Omega-3 supplements are widely available and below I will recommend a few that I think are of good quality from reputable brands that are also backed up by excellent customer reviews. 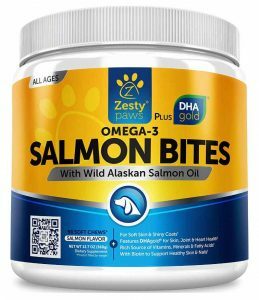 The first product I will recommend is the Zesty Paws Salmon Bites. 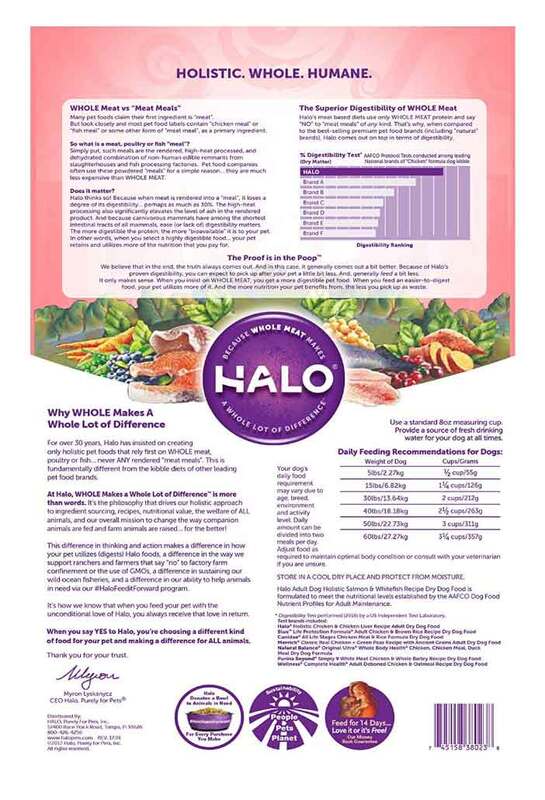 I often recommend vitamins and supplements from this brand as their products only use natural ingredients and always have excellent reviews. 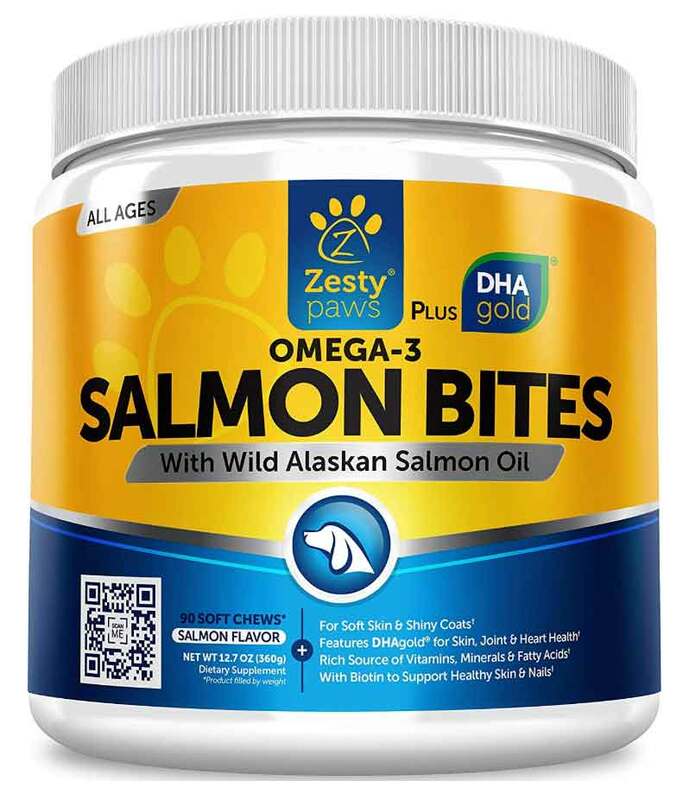 This product is produced from wild Alaskan salmon and is rich in omega-3 and omega-6. They also include vitamin C, Vitamin E and biotin which all help to give your dog a soft, healthy coat. This product is listed as a #1 bestseller on Amazon and has a 4.6 out of 5 star rating. You can read the customer reviews here. Rich in omega-3 & 6. 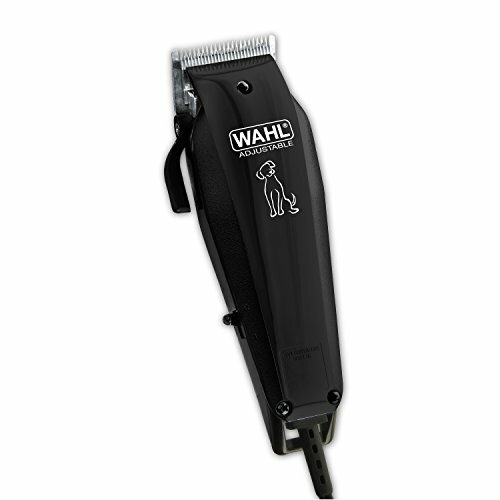 Suitable for dogs of all breeds, ages, and size. Contains DHAgold (algae sourced fatty acid). Vitamin C for antioxidant support. Gives coats a softer texture and silky sheen. Next, I would like to recommend the Maxxi Omega Oil. 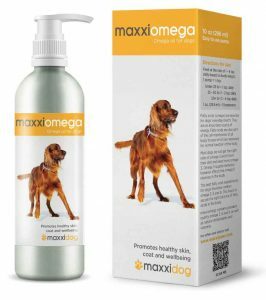 This product contains omega-3, omega-6 and omega-9 making it an excellent supplement to give your dog a soft, silky, shiny and healthy coat. 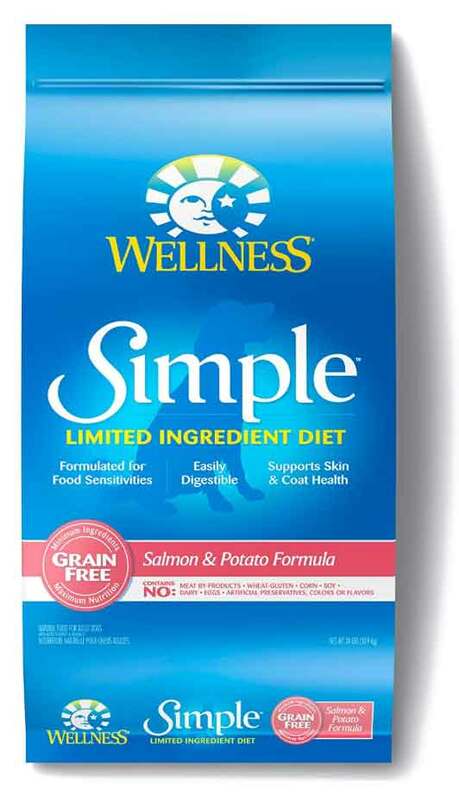 The ingredients are sourced directly from fish fat, flaxseed and soybean. It also has a pump dispenser that allows for mess-free dosing. Maxxi Omega oil has a 4.5 out of 5 star rating on Amazon and you can read the reviews here. Contains omega-3, 6 and 9. Contains vitamin A, D and E.
Supports sensitive and skin dry. Supports blood sugar and cholesterol levels. For more information on omega fatty acids please watch the video below. Your dog’s skin will have many species of bacteria residing on their skin causing no harm at all. However, when certain conditions like a flea infestation, an allergic reaction, an open wound or a lowered immune system occur, bacteria can thrive and an infection can develop. Bacteria thrive in moist conditions and are usually caused by another issue that is adding oil and moisture to the skin. Skin infections can lead to red itchy patches that can seep blood and discharge pus when they break open. More severe infection can cause painful ulcerations and boils. The symptoms of a skin infection are usually seen in the skin folds and around areas of sore, irritated skin. They can vary from a mild irritation and itchy skin to a severe painful infection. 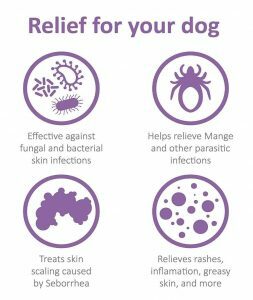 If you notice any of the symptoms below then your dog may be suffering from a skin infection and you should see your vet immediately. Blood or pus seeping from the skin. Most skin infections will be treated will antibiotics and formulated sprays and shampoos. Treatment that requires antibiotics will usually last between 6 and 8 weeks depending on the severity of the infection. As well as the medication prescribed by your vet you will need to bathe your dog in a specially formulated antibacterial shampoo. Below I will recommend some good quality shampoos and sprays that will help your dog overcome their infection and return to having a healthy skin and a good looking coat. 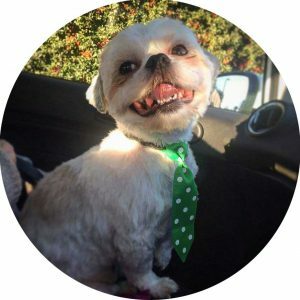 If you would like to know more about dog shampoos and conditioners that contain only natural products and are great for dog’s with allergies or sensitive skin then please read my article – Shih Tzu Shampoo & Conditioner – Because she’s worth it! SynergyLabs Anti-parasitic Dog Shampoo is a good choice if your dog has a skin infection as it is specially formulated to help with skin and coat problems. It will help to treat bacterial and fungal infections, mange and other parasitic infections, inflamed scalp, greasy or waxy skin, red skin rashes and dandruff. It’s paraben, dye and soap free and only uses veterinary-grade ingredients. This shampoo will help to disinfect minor skin wounds and will have a soothing effect on skin irritation and will leave your dog’s coat feeling soft and looking shiny. This shampoo has received the “Amazon’s Choice” award for medicated dog shampoo and has a 4.4 out of 5 star rating with over 1,600 reviews. 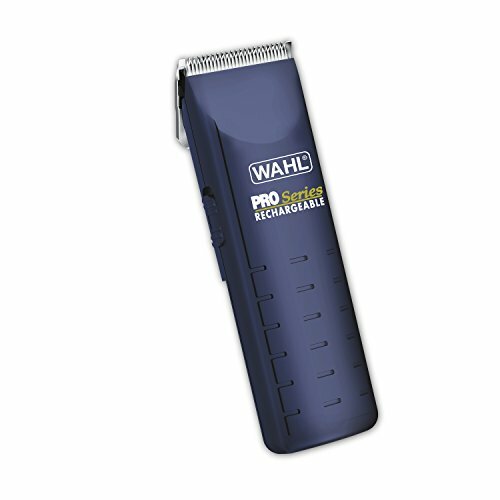 You can read the customer reviews for this product here. Treats skins scaling caused by Seborrhea. Effective against bacterial and fungal infections. Paraben, dye and soap free. Helps soothe infected and irritated areas of skin. Another good choice for an antibacterial shampoo is the Arava Natural Medicated Shampoo. 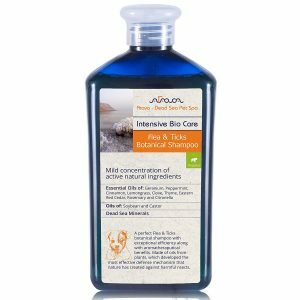 Containing 28 natural ingredients, this is a mild formulated therapeutic shampoo perfect for treating skin and coat issues, hot spots, infections and inflammation. As well as treating these issues it will also help to prevent them from occurring in the first place. It provides a deep clean that reaches into the undercoat, enriching the hair follicles leaving the coat soft and shiny. This shampoo is also suitable for dogs of all breeds, ages, and sizes. It has a 4.5 out of 5 star review on Amazon and you can read the reviews for yourself here. Formulate with premium Dead Sea minerals. Anti-bacterial, anti-fungal, anti-yeast, and anti-itch. Helps heal hot spots, mange, ringworm, dandruff, and seborrhea. As well as using a specially formulated shampoo you might also want to consider an antibacterial spray. A good choice of spray is the Huma.ne Pyoderma Spray. It’s made with 100% natural ingredients including tea tree oil and grapeseed oil. The formula works by penetrating the skins outer layers treating the root cause of the infection. 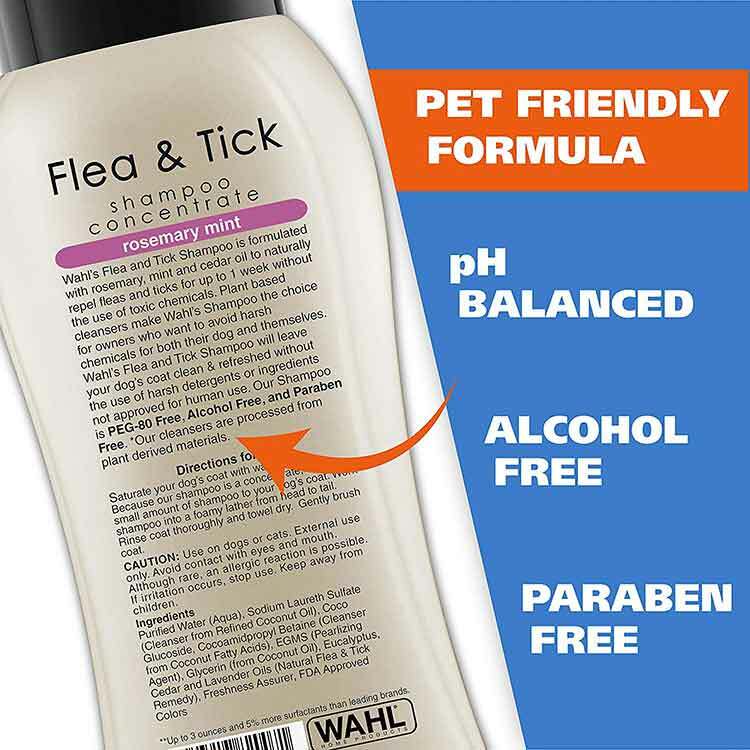 Due to the formula being alcohol-free and using only natural ingredients it’s suitable to use on puppies and is sting-free when it’s applied. 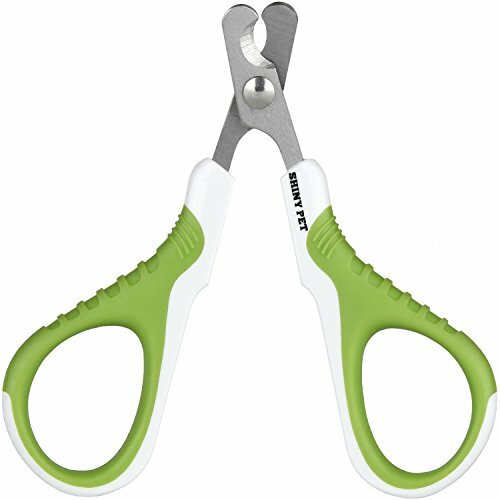 This product has a 4 out of 5 star rating on Amazon and you can read the reviews for yourself here. 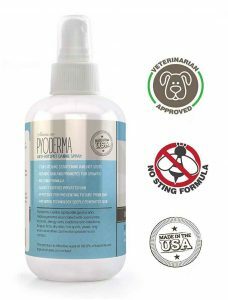 This spray has received the “Amazon’s Choice” award for dog hair loss treatment. Free of alcohol and other painful ingredients. Treats the root cause of infections. 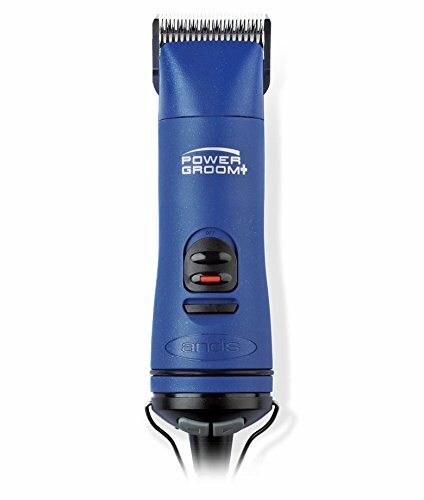 Helps with hair and fur loss. 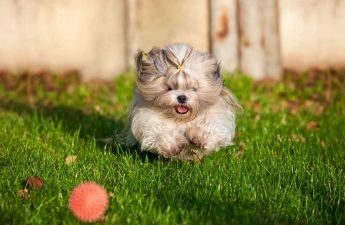 I hope you have found this article useful and now have a better understanding of why your dog might not have a healthy shiny coat and what steps you can take to improve it. As I have mentioned above, if your dog has no underlying health conditions and is fed a good quality dog food then their coat should already be looking healthy. If you are already feeding your dog a quality food and they start to show signs of an unhealthy coat or skin, then it’s very important that you take them to the vet as soon as possible as this could be the symptom of an underlying illness and your dog should be examined by a professional. Best wishes to you and your dog 🙂 Elliott.